Please check if you can see your Wifi SSID (name) if you are currently using a GCB router you should be able to see the 2.4 GHz and 5GHz bands. Try to connect to each one. If this doesn’t work reboot the router. To do so, unplug the power cord from the wall outlet, wait 30 seconds and plug the cord back in. 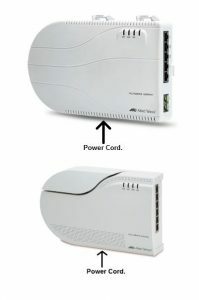 It makes take up to 5 minutes for the router to power back up and obtain an IP address. Try switching the cable box OFF wait one minute and power ON again. Check if the 3 cables at the back of cable box (HDMI, Ethernet and Power) are plugged in properly. You should see a blue light on the cable box when it’s turned on. If you can see a digital clock on the DVR your services should work. If the cables are plugged in properly. Next, try double checking the HDMI source on your TV so it matches the cable box. If you are directed for an activation code, please enter the phone number associated with your account. Note: If you remove wires, make sure to reconnect to the same ports that were in originally! Please access to your closet, and look for your IMG (see 2 pictures below). It is the white box located in your closet and labeled “ Allied Telesis”. Disconnect the black power cord underneath the IMG, wait one minute and plug it back in. It can take up to 3 minutes for the device to reboot and light’s to start blinking. This indicates you should check your services. If you have a device in your closet that does not look like this photo, please call into support.